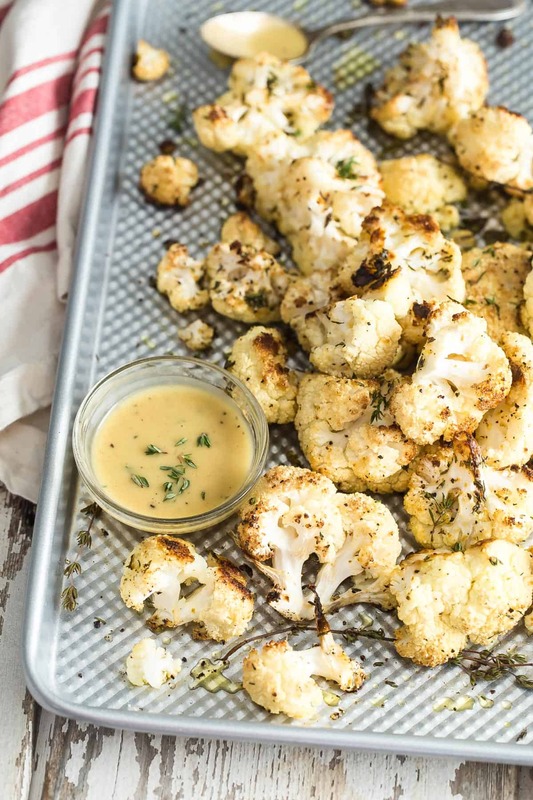 Easy Roasted Cauliflower seasoned with everyone’s favorite seasoning lemon pepper, fresh thyme and a sweet Dijon honey dip. This has been such a fun week catching some snow time in Utah. Every year we take a trip just to make sure our bodies can still switch from being in their forties to being a teenager again. I swear, I’m aching in places that I never knew I had muscles. If you follow my Instagram stories you might have seen me shredding in a snowmobile or flying down a mountain in an inner tube! 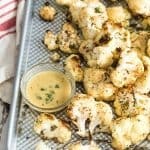 But let’s talk about roasted cauliflower! This recipe is for all of the people who proclaimed 2017 as the year to eat more vegetables. I know some of you did, get those hands in the air! Well, It doesn’t have to be difficult or cost a bunch of dollars. In fact veggies are usually pretty cheap and they can go a long way to feeding a family. I cannot lie but cooking them is super easy. 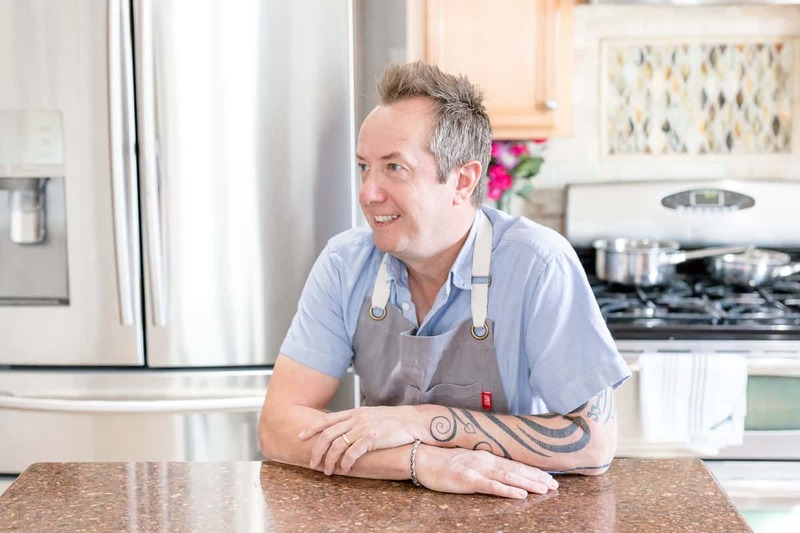 If you check any of my vegetable recipes nearly all of them will be roasted because it’s not just me that loves them this way, the kids do to! Cauliflower is such an awesome veggie cooked many ways like my Blackened Spiced Cauliflower Steaks, but roasting it for me is the best. All you need is olive oil and don’t be shy with it, your favorite spice or seasoning and fresh herbs. This recipe would be fantastic just as cauliflower but who wouldn’t love to dip those big florets into a sauce? Ummm, like a super tasty honey mustard sauce with more fresh thyme leaves. I thought you’d be digging that, fist bump! Have a great weekend and stay warm if it’s cold where you are. Tasty roasted cauliflower tossed in olive oil, lemon pepper and fresh thyme. Served with a honey Dijon mustard sauce on the side. Roughly break the cauliflower into florets of all sizes and transfer to a large bowl. Add the olive oil, thyme and seasoning and toss well to coat the cauliflower. 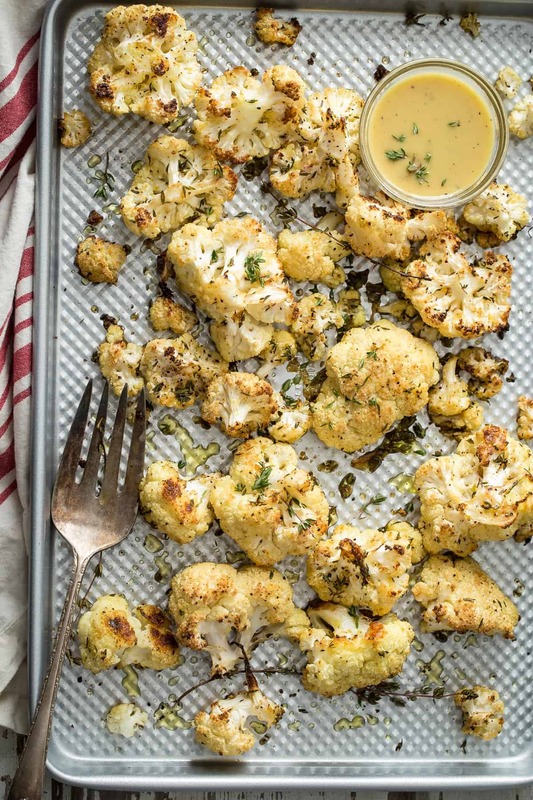 Spread the cauliflower out on a sheet pan and bake in the oven for about 35-40 minutes turning it over halfway through cooking. 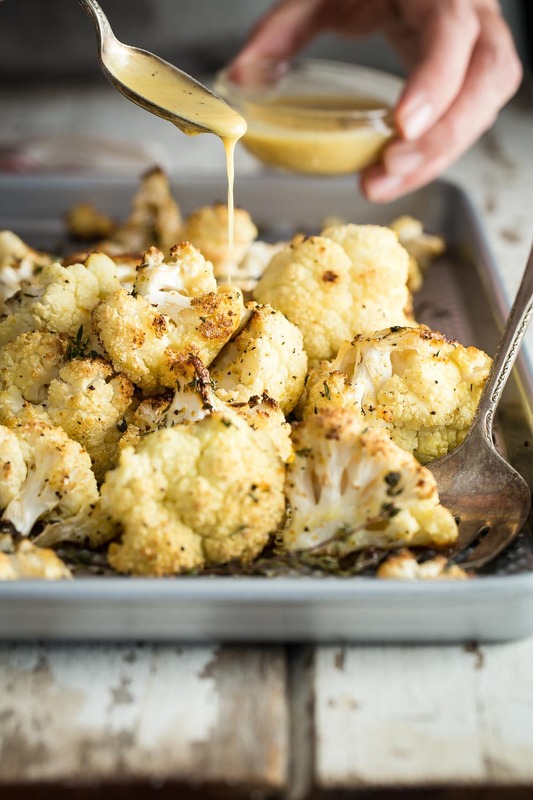 While the cauliflower is roasting, place all of the sauce ingredients into a blender except the olive oil and pulse to mix. With the blender on medium, slowly add the olive oil until emulsified. 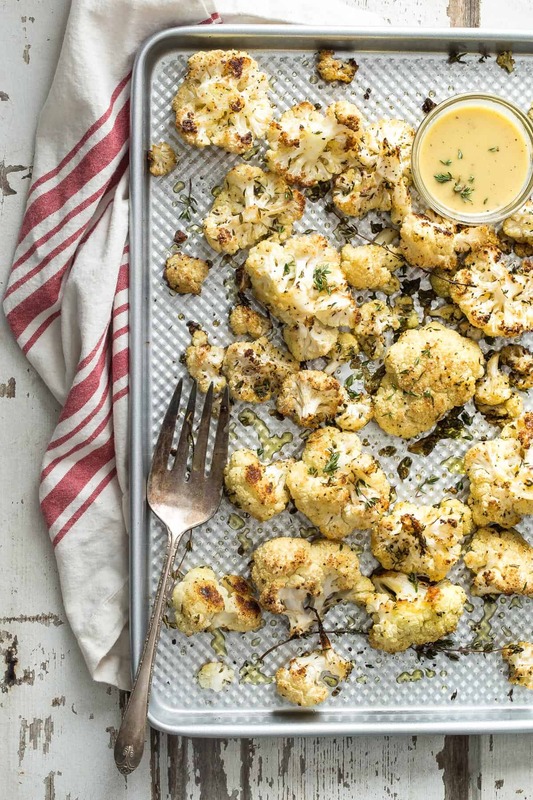 Serve the cauliflower drizzled with the mustard sauce or on the side. This looks delicious but I can’t eat honey. Do you think it could be substituted for another liquid sugar like maple syrup? Or is the honey/mustard combo what makes it great? I tried it with agave syrup and it was amazing! So many other ingredients make it great. I’m sure it’d be good with plain sugar as well but maple syrup sounds a bit strong to me.